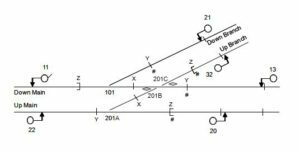 the most obvious is that whereas the straight route through a set of points can be safely traversed at a high speed, the diverging route inevitably consists of a quite sharp radius curve. 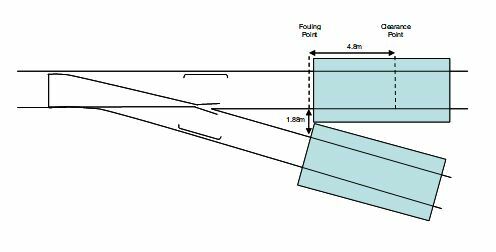 where a point provides trapping protection, in order to protect the running line from an unauthorised movement by a train or individual errant vehicles from a siding or depot. 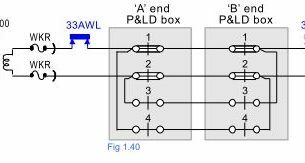 The safety benefit in each case is given by the interlocking arrangements which ensure that the relevant point is designed to be placed (and, in general, locked) in the safest position. 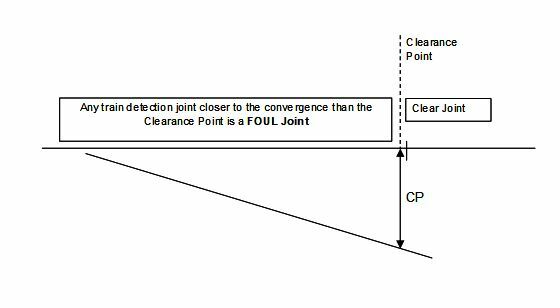 It is conventional to define this safest position as the “Normal” lie, but it is important to realise that the safety benefit does not automatically arise from the nomenclature alone; rather it indicates an intention to impose the relevant locking. 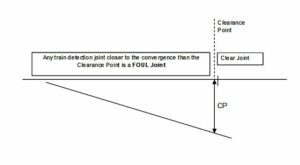 he normal position of points numbered as a crossover shall give parallel movements. 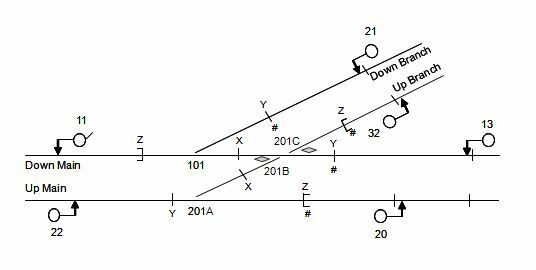 when the above do not apply, be the straight or main route through the points. 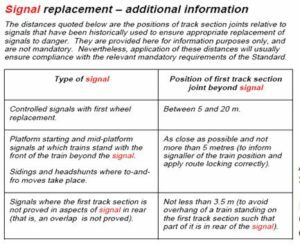 Worked points, train operated points and unworked points that are detected in the signalling system shall have an identity that is unique to the controlling signal box. 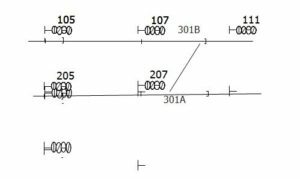 Points with two or more ends that are required to be operated together shall be identified by a common identity and a unique suffix for each end. Each signal box shall have a convention for the allocation of suffixes. Where practicable, the suffixes for new layouts shall increment alphabetically in the down direction. It is permissible to follow established conventions where existing layouts are modified. 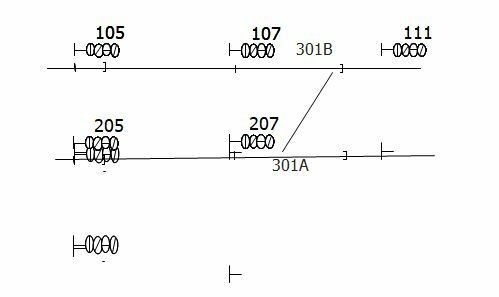 Unworked points in running lines that are not detected in the signalling system shall have an identity in a distinct sequence, similar to that for worked points. for purposes of approach release of the signal. 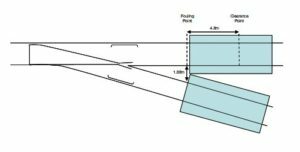 The maximum length is essentially determined by the actual technology but is influenced by the environment; track circuits need to operate reliably and are sensitive to ballast resistance. 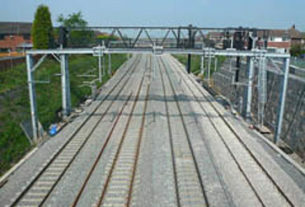 Each track section (track circuit or axle counter section) shall be allocated a defined identity. The identity shall be unique to the signal box or locality. 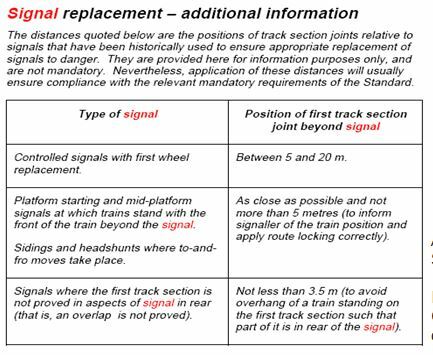 Regardless of signal box or locality code prefixes, there shall be sufficient separation between track sections with similar identities to avoid confusion. 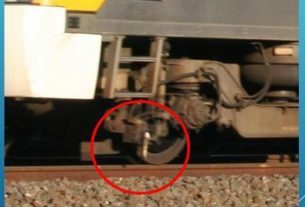 When two or more track sections give a common indication at the signal box, each track section shall be identified by the identity of the signal box indication and a unique suffix.